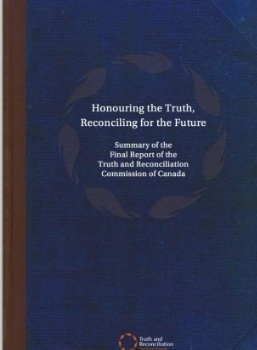 The Truth and Reconciliation Commission released its summary report and findings on June 2, 2015 after six years of hearings and testimony from more than 6,000 residential school survivors and their loved ones. The report includes 94 Calls-to-Action to be followed if Canada is to address the "cultural genocide" of Indigenous Peoples as enacted with the residential school policy and achieve true reconciliation. As is often stated, reconciliation is not an Indigenous problem, it's a Canadian problem and every Canadian needs to be aware of this very dark (but not distant history as the last school closed in 1996) period of history, understand that it has caused an intergenerational and ongoing impact and find ways and means to support reconciliation. In the words of my father, Chief Robert Joseph "We start today. We start with every little step. If we start right now, and this moment is a moment of reconciliation for some of us, it's a huge, huge achievement." We have here the *entire list of the Truth and Reconciliation Commission Calls-to-Actions for reference for our readers. iv. Ensuring that social workers and others who conduct child-welfare investigations are properlyeducated and trained about the potential for Aboriginal communities and families to provide more appropriate solutions to family healing. ii. Require all child-welfare agencies and courts to takethe residential school legacy into account in their decision making. iii. Establish, as an important priority, a requirement that placements of Aboriginal children into temporary and permanent care be culturallyappropriate. mutual recognition, mutual respect, and shared responsibility for maintaining those relationships into the future. data related to homicide and family violence victimization and other crimes. 57. We call upon federal, provincial, territorial, and municipal governments to provide education to public servants on the history of Aboriginal peoples, including the history and legacy of residential schools, the United Nations Declaration on the Rights of Indigenous Peoples, Treaties and Aboriginal rights, Indigenous law, and Aboriginal–Crown relations. This will require skillsbased training in intercultural competency, conflict resolution, human rights, and anti-racism. ii. Community-controlled culture and language revitalization projects. 86. We call upon Canadian journalism programs and media schools to require education for all students on the history of Aboriginal peoples, including the history and legacy of residential schools, the United Nations Declaration on the Rights of Indigenous Peoples, Treaties and Aboriginal rights, Indigenous law, and Aboriginal– Crown relations. I swear (or affirm) that I will be faithful and bear true allegiance to Her Majesty Queen Elizabeth II, Queen of Canada, Her Heirs and Successors, and that I will faithfully observe the laws of Canada including Treaties with Indigenous Peoples, and fulfill my duties as a Canadian citizen." If you are interested in joining our 3000+ subscribers, click the link below to receive our monthly Indigenous Relations Bulletin enewsletter. If you later change your mind it's very easy to unsubscribe.